Nerve Pain Away Reviews - Is it a Scam or Legit? 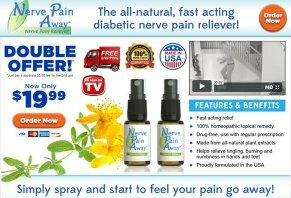 Nerve Pain Away is a homeopathic topical nerve pain spray that claims to relieve discomfort stemming from diabetes using a number of different all-natural ingredients. Nerve Pain Away is a homeopathic spray solution that promises to include an all-natural, fast acting diabetic nerve pain reliever. The product is made from plant extracts, and is supposed to relieve tingling, burning and numbness in your hands and feet. The makers of Nerve Pain Away state that the product is safe to use with your regular medications, and they also claim that it is formulated in the United States. There is no mention, however, of where the product is manufactured. Seeing as a central component of this product is its homeopathic formulation, the first question you might be asking yourself is, what exactly is homeopathy? In the next following section, we’ll take a closer look at this field of study in order to provide some perspective and give you an idea of how effective you might expect Nerve Pain Away to be. In 1796, a German physician named Samuel Hahnemann created a system of alternative medicine that he would come to call homeopathy. The foundational tenet of this system of medicine centered around using small amounts of natural ingredients that would cause symptoms of a particular ailment in otherwise healthy individuals. To measure these minute amounts of ingredients, Hahnemann used a “centesimal scale,” or “C scale,” when formulating his supposed remedies. This scale is still in wide use today across the homeopathic community and the industry that branches outward from it. The C scale represents a series of successive dilutions, with each stage being diluted by a factor of 100 in order to produce the minute doses needed for homeopathic formulas. For example, a treatment with a 2C solution means that the active ingredient has been diluted to one part in one hundred, twice. A 3C solution three times, a 6C dilution six times, and so forth. Based on this, you might be asking yourself just how effective these tiny amounts can be expected to be. According to the National Institute of Health, there is little evidence that can reliably support homeopathy for any medical condition, and it is also reported that several key concepts used in homeopathy are in direct conflict with fundamental concepts of chemistry and physics. For instance, in Hahnemann’s era of scientific advancement, not much was known about the molecule. Today, however, we know that these bands of atoms are the smallest unit of a substance that can still generate a chemical reaction. In some cases, these homeopathic dilutions no longer contain any of the active ingredients. Even the ones that do contain some trace amounts (12c is the smallest dilution that can still contain any original molecules) have largely been shown in clinical studies to have no meaningful biological impact on the human body. The makers of Nerve Pain Away state that their product is officially approved by the Homeopathic Pharmacopoeia of the United States, but what is this organization? Are they an official regulating body, like the Food and Drug Administration (FDA)? The HPUS is a loose collection of publications relating to cataloging and describing various homeopathic treatments, ingredients, and products. It has been around in various forms for many years, but it does not appear to have any ties to any official, government-funded regulating bodies. As a result of this information, being “approved,” in this instance, seems to simply mean that Nerve Pain Away has been designated an “Official Homeopathic Drug” by its inclusion in the Homeopathic Pharmacopoeia. Now that we know a bit more about homeopathy as a practice, let’s take a look at what Nerve Pain Away claims to treat specifically to gain a better understanding of how it might be able to do so. According to an overview of the topic by WebMD, there are over 100 different types of nerve damage that can lead to painful sensations in the body. Additionally, nerve pain stemming from diabetes, which is what Nerve Pain Away is specifically marketed towards, seems to be very common, with up to 70 percent of diabetic individuals suffering from some form of nerve damage. However, with so many types of damage, there are many other ailments that could cause this sort of problem with the nervous system. Diseases such as cancer, HIV, Lyme disease, and certain autoimmune diseases can cause damage, as can trauma, nutritional deficiencies, and some drug side effects. Though there are many different types of nerve damage, Nerve Pain Away focuses on sensory nerve damage, so we’ll also focus on that for now. Some symptoms of this kind of damage might include pain, sensitivity, numbness, tingling, burning, and problems with positional awareness. Common treatments for nerve damage (and the pain it causes) include correcting nutritional deficiencies, regulating blood sugar levels for those living with diabetes, and physical therapy or surgery to repair trauma done to nerves. Again, though, there are many different treatment options available, and they depend highly upon the type of nerve damage you are dealing with. So, at this point, you should have a better understanding of both homeopathy as a practice and the root causes, symptoms and treatments of nerve damage and related pain. In the next section, we’ll refocus around Nerve Pain Away, taking an in-depth look at the ingredients being used by the product in order to evaluate how effective you might expect them to be at treating your nerve pain. What Ingredients Are Used in Nerve Pain Away? According to the product’s website, Nerve Pain Away relies on six natural plant-based ingredients in its formula, including Accontium Nepellus, Hypericum Perforatum, Lycopodium Clavatum, Phosphorus, Rhus Tosicodendron, and Secale Cornutum. Taking a look at these ingredients while referencing sources such as Examine.com, the National Institute of Health, and WebMD, none of these ingredients are reported to show conclusive clinical evidence for helping to relieve nerve pain, whether from diabetes or otherwise. In fact, a few of them seemed to have several potentially adverse effects, which we’ll cover in just a moment. Should you start running for the hills, though? The short answer; No, not necessarily. Here is where the diluted dosages come into play. The ingredients section on Nerve Pain Away’s website tells us that the product contains 12c of each ingredient in use in the formula. This means that they have each been diluted to one part in one hundred,12 times, which is a substantial dilution (10−24). We discussed earlier that this is the smallest reported dilution that could possibly contain any molecules of the original substance – although we also learned that a single molecule (or even hundreds of thousands of them) is unlikely to have have any biological effects in humans. Based on our findings, when consumed in higher dosages (although no specifics were listed), many of the ingredients used in Nerve Pain Away’s formula are reported have potentially harmful—and in some cases even fatal—side effects, according to various authoritative sources like WebMD, Examine.com and the National Institutes of Health. Two ingredients in particular, Secale Cornutum and Accontium Nepellus, have been reported by WebMD to be able to cause gangrene, vision problems, confusion, spasms, convulsions, nausea, vomiting, weakness or inability to move, sweating, breathing problems, heart problems, unconsciousness, and even death. Another ingredient, Rhus Tosicodendron (otherwise known as Poison Ivy), can cause redness, swelling, blisters, severe skin destruction, swelling of the eye (cornea), or loss of sight. When attempting to decide whether or not to purchase and use Nerve Pain Away, keep this in mind: We have no way of calculating the exact danger you may or may not be in when using the product, although based on the details we covered above, it appears the formula’s 12C dilution would provide very little of these ingredients as a whole. Nerve Pain Away is currently available directly from the manufacturer for $19.99, with free shipping and handling included. However, as of the time of this writing, the product has a mandatory “double offer” pricing structure, meaning that you’ll receive two Nerve Pain Away bottles, paying a $5.95 fee for the second bottle, bringing your grand total to $25.94. You’re also given the option to upgrade to a “deluxe” version of the product that includes 50% more liquid for $10 more per bottle, but we aren’t told how much is included in each in the first place. We reached out to customer service to clarify, but we were told that they did not have this information on hand. The explainer video on the website states that each bottle contains up to 60 applications, but we aren’t told if “application” means a single spray, or multiple. Judging by this information, the deluxe bottles might include 90 applications each. Seeing as this would bring the total to $45.94 for everything, it’s important to keep in mind if you plan on purchasing Nerve Pain Away. Regardless of which size you opt for, each purchase comes with a 30-day satisfaction guarantee. If you would like to process a return, you’ll need to reach out to customer service at 1-800-340-3418. The policy states that shipping and handling are not covered, but this appears to be free regardless. When making a purchase on the product’s website, it is stated in the terms at the bottom of the page that you agree to an arbitration agreement as part of the transaction. This means that you are agreeing to handle any potential legal disputes directly with the company instead of going through the court system, and it might also limit your ability to be a part of a class-action lawsuit. We’d recommend that you keep this in mind if you plan on making a purchase through the main website. So, at this point you might be wondering if any competing homeopathic products exist that claim to be able to reduce or even eliminate nerve pain. Here’s a simple way to find out; type “Homeopathic Nerve Pain Spray” into Google, and you’ll be greeted with literally dozens of products claiming to relieve related symptoms, many of which are sprays like Nerve Pain Away. Other alternatives include chewable options and those in swallowable pill form. Almost all of the products we found during our research contained at least one of the ingredients used in Nerve Pain Away’s formula, with the most common seemingly being Hypericum Perforatum, or St. John's Wort. Nearly all of the ingredients found in the products we encountered during our research were potentially harmful, both when ingested and when applied to the skin, according to WebMD and Examine.com (though as reported above, 12c represents an ultra-diluted dosage). Again, very little clinical data has been shown to support using homeopathic ingredients to cure or relieve a specific ailment according to the National Institute of Health. Several other treatments options exist, and your doctor would likely be able to tell you more about these as they relate to your specific situation. Keeping this information in mind will hopefully allow you to make the best decision possible when looking for an effective solution to your nerve pain. The Bottom Line: Is Nerve Pain Away Right for Me? Let’s get one thing straight here; Nerve Pain Away contains several ingredients that have been shown by sources like WebMD and Examine.com to be harmful to humans, albeit it contains them in very small, very diluted amounts; 12c of each, to be exact. We also learned that a 12c dilution is far more minuscule than the amount of lead typically—and harmlessly—found in your tap water. Do not use homeopathy as a replacement for proven conventional care or to postpone seeing a healthcare provider about a medical problem. If you are considering using a homeopathic remedy, bring the product with you when you visit your healthcare provider. The provider may be able to help you determine whether the product might pose a risk of side effects or drug interactions. Follow the recommended conventional immunization schedules for children and adults. Do not use homeopathic products as a substitute for conventional immunizations. Women who are pregnant or nursing, or people who are thinking of using homeopathy to treat a child, should consult their (or their child's) health care providers. Tell all your health care providers about any complementary health practices you use. Give them a full picture of all you do to manage your health. This will ensure coordinated and safe care. In the case of Nerve Pain Away, this is the best advice we could possibly give to you going into a potential purchase. While waiting for your appointment, be sure to read about some of homeopathy’s core theories, and whether or not they’re scientifically sound. Have you used Nerve Pain Away before? Leave a review and share your valuable experience with others. I bought this thinking from the reviews it was going to help me, but I wasted my money. It smells like tiki torch fuel and did nothing to stop the pain. I wish I would not have wasted my money now. How can someone claim this stuff works when it clearly does not? I would not recommend this for pain to anybody. I had knee surgery and was walking different, which caused issues with my ankle. Nerve Pain Away really worked for me; it has reduced stabbing pain and inflammation. I tried several products, and this gave me the fastest and longest lasting relief. I apply in am and before bed. I will continue to buy and use. I wish the bottle was larger, but the bottle I have has lasted a month. I gave a bottle to my dad, he is 87, and his knee pain was keeping him awake. He used it and said it really worked for him. I also let my father-in-law use it one night, and he said it worked for him. I bought at Walmart so did not have to pay shipping. I saw this advertised on TV and wanted to try it because my Lyrica is too expensive for me. I found it at Walmart and decided to try it as my feet were burning bad from nerve damage from my back. The product really did stop the burning in my feet almost immediately, but the smell was horrible, and it was so strong it permeated my mouth and eyes, and my roommates didn't appreciate the smell either. I will have to stay in my room for a while next time. I definitely cannot use at work with the smell. But it really did work. Expensive for tiny bottles, BUT OMG, it works fast. I agree, it is expensive and I probably won't use it unless I need too to function. Or becauae pain is so bad. If it wasn't so high, I would use it daily. It glides on smooth and I can get about 5-6 hours out of one use. It works by the time you apply it and rub your hands to get extra coverage for hands. My husband had back problems and he came in all humped over from work. I rubbed it on his back and he had immediate relief. He said his neck was sore and starting to get a headache. I rub some across his neck and he was like "Wow!" I'm hoping this comes in a larger quantity at a more reasonable price. On my neuropathy in my feet, it did lessen the pain, but not like it did on my hips and back. This product is way overpriced! When I received the two bottles, I couldn't believe how small they were. They come in a good sized box with a bunch of foam peanuts and I had trouble finding them! I had to dump the entire box to locate these TINY bottles. It is not worth the cost, and to have to pay shipping is ridiculous because they could have used a much smaller box. The bottles themselves are not even as long as my thumb and I have very little hands. I would never recommend this to anyone. Rip off big time! Don't order! You will never get it. I have contacted them twice, and they give a bogus fake number that you can't track your package with. No product and no refund. Great business, NOT! Write a Review for Nerve Pain Away!